Leeds-based zine maker Melanie Maddison will be bringing her poster series of inspirational European women to the Victoria Baths Fanzine Convention in May, and what more appropriate place to display them than around the balcony space overlooking the former female pool? The series, drawn from Melanie's collaborative zine Shape & Situate: Posters of Inspirational European Women, comprises the 75 plus A3 posters that have featured in the zine so far. The posters have been created by women all over Europe, using collage and mixed media, illustration, photography, commix, digital work, hand-sketched drawings, text and everything in between. The Shrieking Violet spoke to Melanie to find out more. 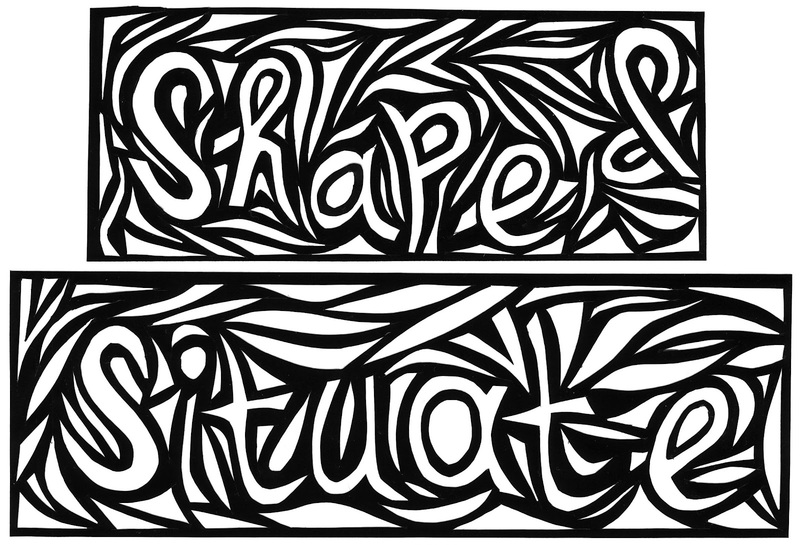 SV: What is Shape & Situate, and how long have you been making it? 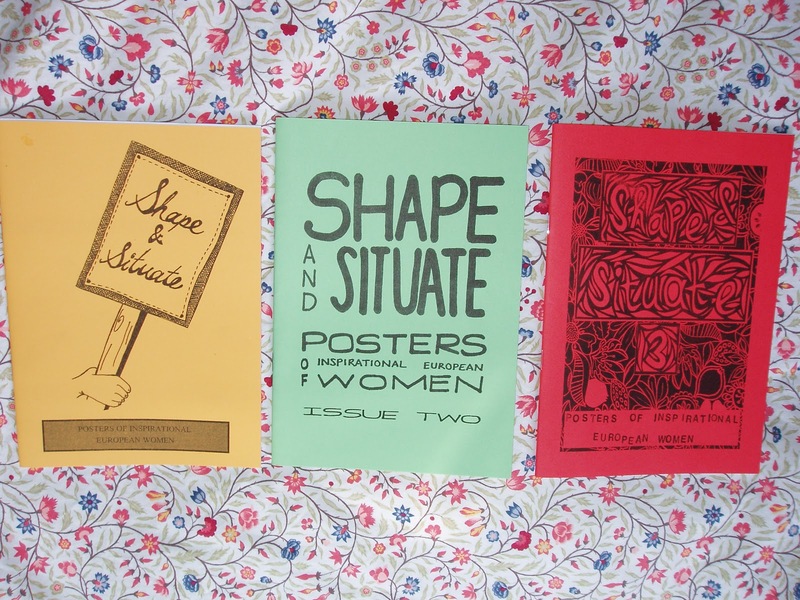 MM: Shape & Situate: Posters Of Inspirational Women zine has been going for three years, and three issues. Each issue has contained around 25 A5 original posters made by artists and DIY creative people from within Europe. The posters feature artwork and information on an inspirational or radical European women of the poster maker’s choosing. 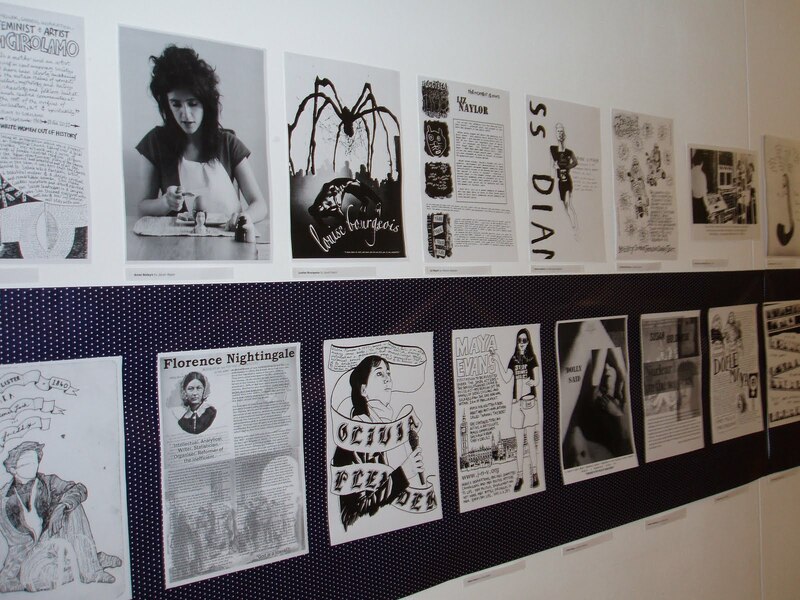 The aim has been to highlight the (often hidden) history and lives of radical inspirational women and collectives from Europe, as a way of connecting us with the past and the present through a cultural (re-)articulation of these women’s lives. There’s no life that does not contribute to our collective history, yet conventional history books show us that it’s rare for women’s lives to be documented as readily as men’s, especially women in more underground, domestic, or radical spheres. I hate to think that in years to come it’ll only be the ‘elite’ people on the top of the pile who’re remembered, creating a void and mass forgetting of the great work and lives of so many people within our social, cultural and political makeup, communities, and lives. Women such as those who are collected in the zine (and many, many more besides) are important to our collective history, women who have helped shape and situate our lives whether we know it or not. I wanted to try and make a zine to honour and celebrate and inform others on some of these women. 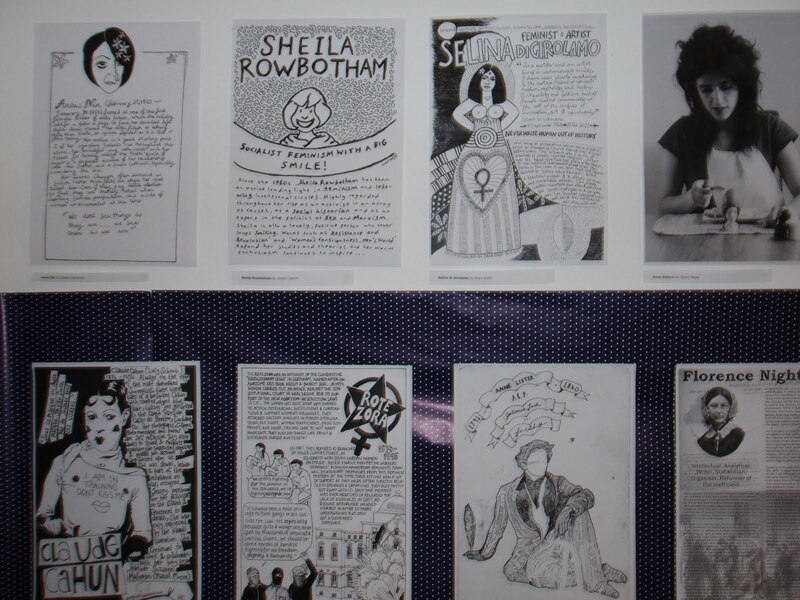 The zine aims to activate feminist cultural memory, to inspire in the present, and to visually bring women’s social and political history to life and into view. SV: Have you made other zines? MM: Shape & Situate is the only zine I’ve got the time to make at the moment, but I’ve made many zines before these ones. My favourite zine to work on, and the one that I was probably most proud of, was Colouring Outside The Lines. Colouring Outside The Lines collected together interviews I did with a huge selection of seriously amazing contemporary female artists from all over the world. It ran for five issues between 2005 to 2009, and is a project that I plan on going back to at some point. I miss making that one but it sure was time consuming to fit in the 70 plus interviews! I also edited the zine Reassess Your Weapons, and have made other zines, such as: Taking Cultural Production Into Our Own Hands, With Arms Outstretched, UK Ladyfest Artwork Zine, and I'm Not Waiting: Doing It Yrself Now. Plus I’ve had a hand in many other collective zines. SV: Why did you start Shape & Situate, and what made you decide to do a participatory project? MM: I started the zine as I have a huge amount of love and respect for poster projects hailing from the US such as Celebrate People's History, Inspired Agitators and Firebrands: Portraits of the Americas. I love what these poster makers were creating and sharing, and how they were educating with their work. I got to thinking though that I’d love to see a more European perspective, and a wider selection of female subjects, and from there Shape & Situate was born. I’ve since shared the zines with those involved with some of the projects I mention that had inspired the zine, which was a great way to start to complete the circle. My respect for the enormous amount of creative social history projects that are being made across the world is why I include such a big list of further reading in the intro to the zine, in a hope of directing readers towards projects beyond Shape & Situate alone. I don’t think this zine could have been anything other than collaborative (plus sometimes I think it’s the only way I like to approach making zines – who wants to only hear their own voice and ideas? I know I don’t!). It had to be collaborative as I wanted to bring together ideas of who contributors from across Europe found inspirational. To collaborate is to situate yourself within the community that you’re working with and sharing with. I wanted to learn myself about inspirational women myself, not just dictate a huge bunch of posters on who I already knew that I found inspirational myself. I learned a great deal from putting this zine together; many of the women in this zine were unknown to me before I was approached by contributors with their ideas. And, this is all part of the point really, to share knowledge and experience of women who have been hidden from mainstream history. I couldn’t have made the zine without the knowledge and desire from the contributors to tell the lives and tell the story of these women’s lives, women who had individually and uniquely shaped and situated them. SV: How do you find contributors for Shape & Situate? MM: The zine has been open to anybody from Europe who wanted to make a poster. To start with the first issue was made up of friends and friends-of-friends who I approached with my initial idea and people ran with that idea. I’m lucky to know a huge amount of crazily talented and creative people (not only conventional ‘artists’, but also cultural producers who approach and make ‘art’ in a more DIY way and would never refer to themselves as ‘artists’ even when in their own ways they are), and I’m thrilled to be able to work with as many of them as I have on this project. After the first issue came out word spread a little, and I was lucky enough to have people approach me to be involved too, which worked out great. Finding people I’d love to contribute is the easy bit (I am a huge admirer of people’s creative talents and am always on the look out for folks I’d love to work with on one thing or the other); twisting their arm into making a poster when I know that these people have 101 more pressing things to do, and ample projects of their own to be working on, is the tough bit! Which is why I’m so grateful every time a zine actually comes together and is filled with so much great work. I’m in awe of my contributors and have a lot to thank them for! SV: What type of women are featured? Are a lot of them lesser-known? MM: It’s the poster makers that decided to feature them, not me. There’s a mixture of lesser-known, and more well-known women. The original brief was to focus on lesser-known women, but it’s hard to draw that distinction when it would have been unfair to omit some of the more well-known women in a project that looks at inspirational women. I didn’t want to enter into some distorted ‘popularity contest’ and refuse contributions on women who are already well-documented just because of that fact, because clearly all of these women are inspirational, and thus worth being part of this project. The women featured come from all sorts of social, cultural and political backgrounds, and include authors and writers, scientists, teachers, sports women, political and social activists, visual artists, musicians, zinesters, performance artists, globetrotters, cartoonists, architects, aviators, actresses, film makers, strike leaders, comedians, and organisers and reformers. Amongst others! 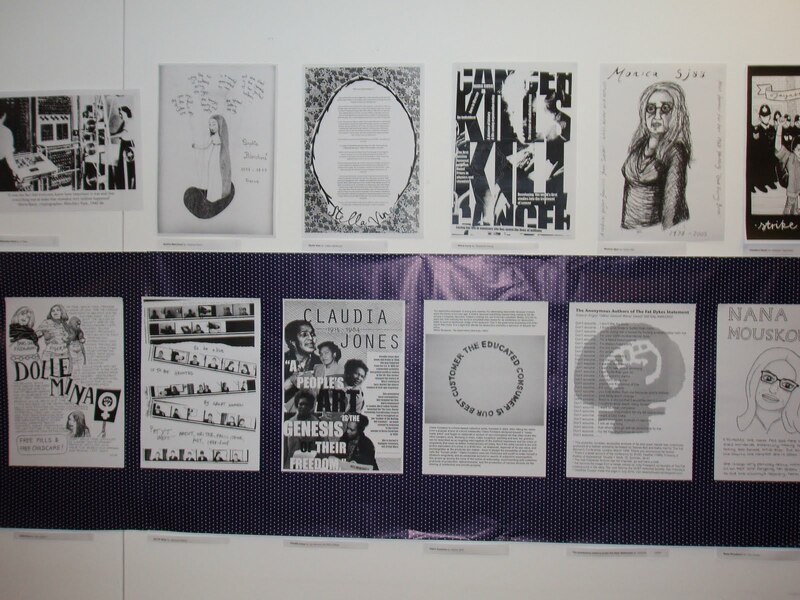 SV: Shape & Situate: Posters of Inspirational European Women has previously been exhibited at the Women's Library in London. How did that come about and how did it go? 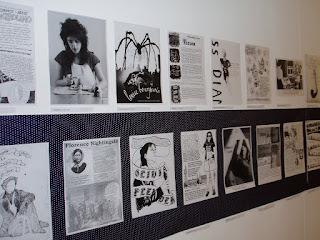 MM: My dear friend Red Chidgey organised the 2011 Zinefest! at The Women’s Library in London and asked me if I’d like to be involved again. I proposed to get posters made up from Shape & Situate (there were only two issues at the time) and put them on the walls. It was as simple as that! Ever since I first started getting submissions for issue 1 of the zine I knew that I’d love to see the posters in a larger format than the A5 zine alone, so when Red asked me if there was any way I’d like to contribute to the Zinefest I knew exactly what I’d like to see happen. The fine folk at Footprint, Leeds, did a great job at laser printing A3 posters of each page of the zines for me. 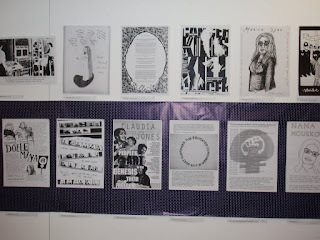 I’d been involved in the 2009 and 2008 Zinefests at The Women’s Library, again, due to Red’s organisational skills and vision. 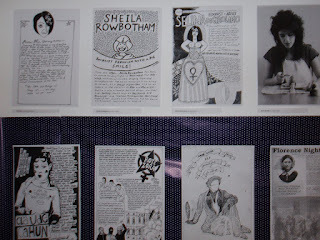 In 2009 I curated an exhibition of Comix Zines made by UK female creators. It was such a great project to work on. There was a huge amount of work on the walls (and hung from the ceiling!) in that exhibition and it was really well received, hence, in part why I think Red asked me to be involved again in 2011. I’m so grateful for what Red, and the staff at the Women’s Library have allowed me to get away with doing in that building! Incidentally, please sign the petition to save The Women’s Library from closure. 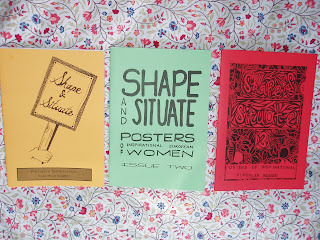 SV: Are you going to keep adding to the poster series and making more Shape & Situate zines? Do you plan to exhibit the posters in more places? MM: I’ve genuinely no idea. I’m one of those people who can’t really think into the future (I’m perpetually petrified of the future), and am usually just driven by ideas that come to me at 3am instead of planning anything out properly. Maybe there’ll be a fourth issue of the zine, and even more posters to add to the exhibition, I’ll wait and see how well received issue 3 is first, and wait to see if I get any offers of contributions to another issue – I hate badgering people into contributing. At the moment though I’m trying to focus on hopefully getting the exhibition shown in as many places as I can this year; I’d love for more people to be able to see all the great work that’s been made for this project, and also to spread the word about all the subjects that this project has managed to give voice to. From enthusiasts scribbling alone in their bedrooms to professional design collectives, fanzines are made by people of all different interests and backgrounds. A film made by Salford Zine Library, a growing archive of self-published material, brings together the stories of fanzine makers from around the world, showing who they are, what motivates them and how they go about getting their work out into the world. Self-Publishers of the World Take Over was conceived a couple of months before a recent exhibition at Salford Art Gallery and Museum which put on display the Library's diverse collection, ranging from football fanzines and science fiction pamphlets to photocopied free sheets and hardbound artists' books which cost £50 per copy. What all of the material in the library has in common is that it is all independent and self-published – and that it was all donated. The documentary consists of talking heads of the makers behind the collection, aiming to create, says the film's director, illustrator and designer Craig John Barr, a “focus point that tied the exhibition together”. The film is constructed around questions about the zine-making process, featuring responses recorded by Craig and cameraman Luca Rudlin around Manchester and Salford, or footage shot on SLRs and webcams by zine-makers in other countries including Brazil, America and Australia. Craig and Luca visited several design studios in Manchester, including DR ME and OWT Creative in Hope Mill, Ancoats, and Manchester Municipal Design Corporation, who are based in Hotspur House, as well as zine-makers such as Vapid Kitten and the Shrieking Violet. Craig also made stop motion animations using a webcam gaffa taped to his ceiling. Footage was recorded over a month and then Craig had the job of sifting through around twenty hours of film. Despite the challenges of making a film from scratch – and having to learn new software and enduring a bout of flu during the editing process – Craig says the film “does what it set out to do”. Craig started Salford Zine Library in January 2010 when he and fellow illustrator and designer Matthew Walkerdine were living in Salford, and the collection was initially housed in the city's Islington Mill arts venue. Craig and Matthew both made zines and, after contributing to zine libraries in cities such as Los Angeles and Toronto, realised that Manchester and the North West lacked a zine library. The Library has a steady stream of donations, which arrive at the library via Craig's postbox, and contributions now number around 1,500. Craig explains: “Zines are everywhere – everywhere there is an element of counterculture people are making zines. There are hundreds and hundreds of contributions that come into my mailbox from everywhere. India, Tokyo, Taiwan, Latin America – Chile, Brazil etc. In India, zines are mainly graphic design. In Sao Paulo they're linked to the punk scenes which goes back decades. I get some really odd zines. People seem really happy I've asked them to contribute to the library. They are happy their work is getting seen.” In future, Craig would like to classify the material in the library and create a catalogue. It's not uncommon for visitors to turn up at Craig's flat with boxes full of zines. He said: “People come up to me and say they've got a load in the loft and every now and then someone comes and knocks on my door with a box.” One box came from a printers who, every time they were asked to do a print run of a zine, printed one extra and added it to the box. Self-Publishers of the World Take Over will be screened at the Victoria Baths Fanzine Convention on May 19 at 12.30pm upstairs in the committee room in the former superintendent's flat, followed by a director's Q and A.
Extracts can be seen on Salford Zine Library’s Youtube channel at www.youtube.com/user/salfordzinelibrary.